The Israelites are disturbed by the prospect that one of their tribes will be annihilated. Yet, they swore to keep their daughters from the Benjaminites. In order to save Benjamin, they kill the inhabitants of Jabesh-gilead and give the girls to the Benjaminites. The Benjaminites also kidnap girls from the annual festival and take them as their wives. 5, 8, 10-12: The Israelites asked, “Is there anyone from all the tribes of Israel who failed to come up to the assembly before the LORD?” For a solemn oath had been taken concerning anyone who did not go up to the LORD at Mizpah: “He shall be put to death.”… They inquired, “Is there anyone from the tribes of Israel who did not go up to the LORD at Mizpah?” Now no one from Jabesh-gilead had come to the camp, to the assembly…. So the assemblage dispatched 12,000 of the warriors, instructing them as follows: “Go and put the inhabitants of Jabesh-gilead to the sword, women and children included. This is what you are to do: Proscribe every man, and every woman who has known a man carnally.” They found among the inhabitants of Jabesh-gilead 400 maidens who had not known a man carnally; and they brought them to the camp at Shiloh, which is in the land of Canaan. 25: In those days there was no king in Israel; everyone did as he pleased. The book of Judges ends with a dilemma: how will the Israelites, who swore to keep their daughters from the remaining Benjaminites, prevent the tribe of Benjamin from being wiped out? They brew two plans, the first involving murder and the second involving kidnapping. First, they decide that the inhabitants of Jabesh-gilead deserve to die for not gathering at Mizpah. They kill the people of Jabesh-gilead and give the young girls “who did not know a man carnally” to the Benjaminites. Then, they tell the Benjaminites to kidnap girls from the festival at Shiloh. The festival, which includes dancing in the vineyards, is probably some form of the Feast of Tabernacles (Sukkot), which takes place after the summer fruit harvest. Three important sites are mentioned in chapter 21: Shiloh, Bethel, and Mizpah. According to Halpern, Shiloh is “a place N of Bethel inside the land of Canaan where the Israelites convened sacred assemblies in the days before Solomon established the Jerusalem temple as the major center of [Israelite] worship (Joshua 19:51; Judg 18:31; 21:12–21). The priests who presided at this shrine appear to have been from the lineage of Eli (1 Samuel 1–4; 14:3; 1 Kgs 2:27). At some early time the shrine was apparently abandoned (Jer 7:12–14; 26:6–9; cf. Ps 78:60).” (Halpern, Baruch. “Shiloh” in ABD V, 1213-15) South of Shiloh is Bethel, which, according to Brodsky is “next to Jerusalem the most frequently occurring place name in the OT, referring both to a city and to a religious sanctuary which was either in or near the city. 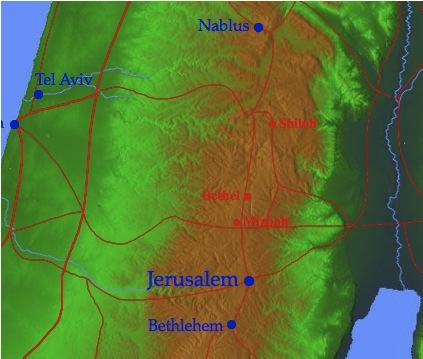 Two factors, somewhat interrelated, are responsible for the importance of Bethel: (1) it was associated with a religious sanctuary; and (2) it lay along a crossroads and near a physical and political frontier that divided the central hill country of Palestine into two parts.” (Brodsky, Harold. “Bethel (place)” in ABD 1, 710-712) Finally, according to Arnold Mizpah “”was a city of political, military, and cultic significance located in Benjaminite territory. It frequently appears in stories set in the premonarchical period and is associated with a motif whereby all the Israelite tribes gather in solemn cultic assembly to pray before undertaking Holy War against an enemy… Recent research (e.g., Aharoni 1968: 30) suggests that such border fortresses not only controlled military and economic access to Judah, but served an important cultic function as well. Sites like Mizpah may have contained sanctuaries where travelers could offer proper sacrifices to the national lord on entering or leaving the land. This role may explain the origins of Mizpah’s subsequent cultic importance in Judah, and Hosea’s vague condemnation against the priests, who “have been a snare at Mizpah” (Hos 5:1)” (Arnold, Patrick M. “Mizpah (place)” in ABD IV, 879–81). Butler, Trent C. “Judges” (Word Biblical Commentary vol. 8; Nashville: Nelson, 2009). Collins, John J. “Introduction to the Hebrew Bible,” Word Biblical Commentary vol. 15 (Minneapolis: Fortress Press, 2004).